Today, Digital Extremes — makers of the popular free-to-play game Warframe — announced its latest project. 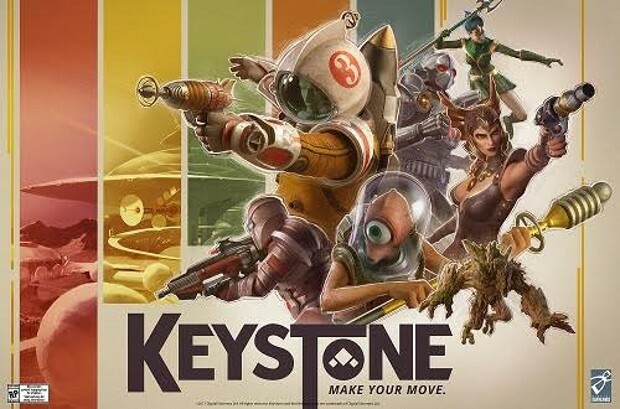 Keystone, a game with first-person shooter and deck-building elements, is a 1970s multi-verse board game. (I’m starting to feel like I’m describing something designed by David Lynch…) The game begins with players on the starting square of the “board” and requires them to use decks of cards to earn benefits, wield powers, and use weapons. In addition to the game itself, Digital Extremes has also announced signups for Closed Alpha. It appears the Alpha will launch rather quickly with the first wave of players receiving notification in just two days on May 25. At that point they will be able to start downloading the game so they will be ready to play when the Alpha kicks off on the 26. Sign-ups for the Alpha are available on the Play Keystone site. Just got my alpha invite today, looking forward to trying it out.